Wheee! 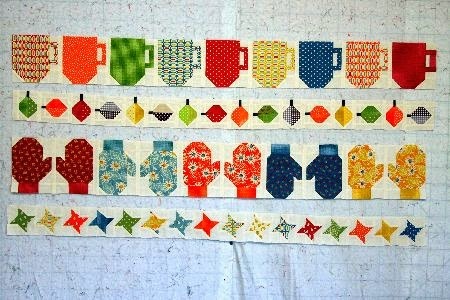 I'm all caught up on my Blocks of the Month. OK, at least the ones that meet this week! First, I worked on next section of Sample This! 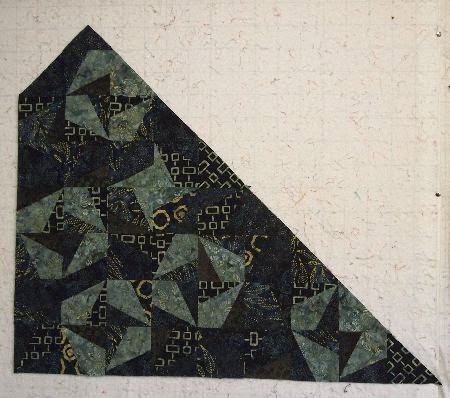 I'm making it twice, once in the colorway shown on the pattern cover (above) and once in the same fabric collection, but in the green colorway (below). 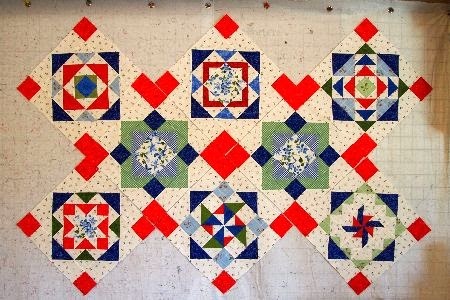 This "sampler" takes a long time because of the many fabrics in each section. Plus the fact that each 4.5" square is three different fabrics! It's going to be an incredible quilt when it's finished, but -- boy, howdy! This is Marti Michell's "5 is Fabulous" block party at Ruth's Stitchery. 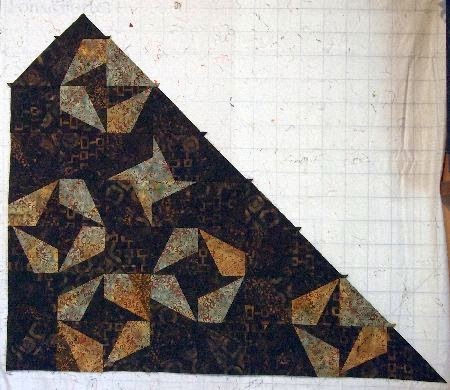 In Bonnie Hunter's new book, More Adventures with Leaders and Enders, she recommends making the setting blocks as "leaders and enders" while piecing the main blocks on a quilt. Doh! This one is much easier than the Sample This! quilt, but I think it's going to be someone's favorite when it is finished. Yes, the rows are different lengths. I decided not to add the end pieces until I have all the rows finished. That way, I can adjust so the rows are the same length. I can't believe I sewed 6-8 hours every day last week and that is all I accomplished? 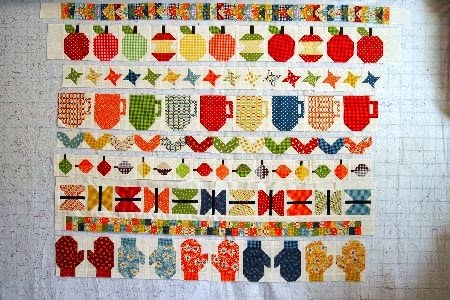 Oh, well, I DID bind and mail the Farmer's Wife quilt, and piece, quilt, and bind the August Jelly Roll Party sample. And make 10 Block a Day Shoo-Fly blocks. And finally get the patio planter boxes planted. And Skype with My Little Sailor from Singapore. Tomorrow is the July 1st UFO Parade. Come back to see what the 12 in 2014 Challengers finished this month! LOL I thought the "leaves" were Christmas baubles!! I think you got loads done..loving the "5 is fab" too.